Minimal preparation is required before playing your violin as it is constructed as a complete instrument. However, you must take care when handling your violin as it is made up of many parts. Always pack your violin and bow away in its case when not in use. Turn the restraining hook to unlock the bow from its position in the case. Always take your bow out of the case first, and then your violin. Tighten the hairs on the bow before playing by gently turning the tension screw. Be careful – do not make them too loose or too tight! Apply rosin on the bow hair before playing by placing the bow on the rosin surface and moving the bow back and forth a few times so the rosin gets on the hair. Rosin is needed to help create friction for the bow. It is this friction between the bow and strings when playing that makes the strings vibrate and produce a sound. New bows need a little bit more rosin at first. Tune your violin using the 4 tuning pegs. Carefully loosen one tuning peg at a time, wind and unwind the string to correct the pitch, then push the tuning peg back. Use the fine tuners to complete the tuning process, and then your violin is ready to play! When you are finished playing, loosen the hair on the bow before putting it back in the case. And if you have a soft case, be sure to put your violin in first, then the bow. Violins are made of wood and are very sensitive to temperature. Make sure you never leave your violin in the boot of your car on a hot Summer’s day! Heat will cause your violin to go out of tune and may even cause cracks or other damage. Wipe your violin down after you use it with a soft cloth. Make sure you never put your violin down or in its case string side down. Always store it string side up. Always have some spare strings handy in case you break one! You will need to always have rosin for your bow handy. Apply the rosin to the bow before you start playing. It’s very important to get the right size violin for your child. Violins come in all different sizes. An adult would play a full size 4/4 violin, but children will need a smaller size to begin with. 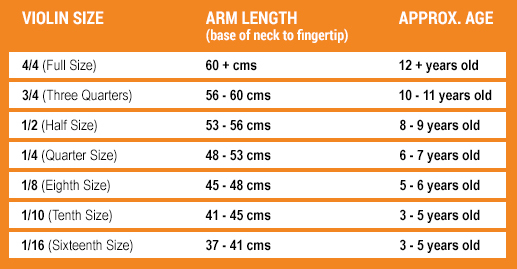 We recommend having your child measured for their violin by your teacher or the store you have rented / purchased your violin from. Please see our video and tutorial links below for detailed clips on how to hold your bow and your violin. The violin is the leader of the orchestra with it’s versatile sound and agility. Violin players usually sit as a section or as part of a chamber group. Whilst there is usually strength and safety in numbers when playing the violin, it is one of the most demanding and technically difficult instruments you can learn to play. 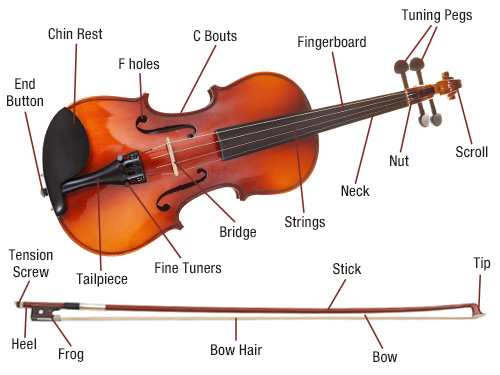 There are four strings A, D, G and E. Arco bowing and pizzicato plucking of the strings are some of the many ways to create different articulations and sounds on the violin. From Bach to Mozart, Strauss to Stravinsky, violin repertoire is endless, diverse and exciting!